Jean Marie Baldwin teaches a new Naples Art Association art class on Shibori, a Japanese style of fabric resist-dyeing. Even the most experienced artists are sometimes looking for something new. The Naples Art Association understands. Tucked among the acrylic painting and ceramics classes, students can opt for a Tuesday afternoon class in shibori, taught by Jean Marie Baldwin. Sign up today, and discover the magic! The deadline for signing up for Naples Art Association courses during session one, including shibori, is Wednesday, Oct. 17. Don’t miss this unique opportunity to refresh your creative spirit with a new experience. Shibori is offered on Tuesday afternoons from 1-4 p.m. beginning Oct. 23. running through Nov. 13. An additional supply fee includes two scarves, plus dyes and all other materials and equipment necessary. Additional scarves and shawls are available from instructor at an additional charge. No previous experience necessary. Join this new course and explore various resist-dye techniques such as folding, wrapping, pleating and clamping to create beautiful one of kind repeat patterns. 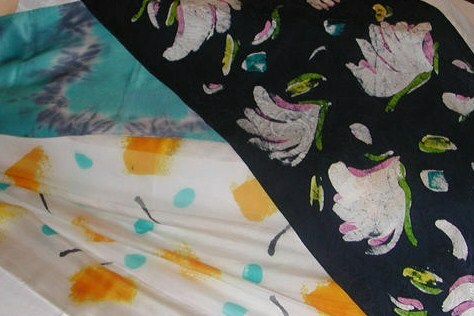 In this course, each student will complete at least two one-of-a-kind silk scarves. Cost: Members $130, Non-Members $180 Supply fee: $20 payable to instructor at first class. Session one begins on Oct. 22, and there are many courses to choose from. Take time to create! The Naples Art Association is a 501(c)(3) nonprofit organization, founded in 1954 by local artists. Its mission is to educate and promote visual arts in Southwest Florida. Through its programs, the Naples Art Association is dedicated to serving individual artists of all ages and skill levels, along their creative journeys. The von Liebig Art Center is located at 585 Park Street in downtown Naples and is open Monday through Friday, 10 a.m. to 4 p.m., Saturdays in season. For more information, please call 239-262-6517. This entry was posted in Education and tagged art education, art hobby, arts, classes, japanese fiber art, japanese techniques, japanese word meaning, jean marie baldwin, Naples Art Association, shibori, tie dye, von Liebig Art Center by Naples Art Association. Bookmark the permalink.